getcalc.com's Capacitor Charge & Energy Calculator is an online electrical engineering tool to calculate the charge & energy stored in a capacitor. The required input parameters & values are capacitance in farads & voltage or potential difference in volts. 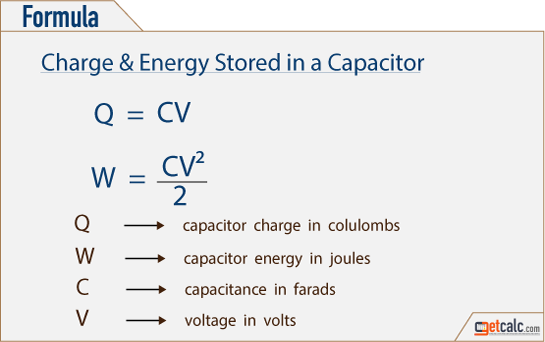 Capacitor is a passive electric & electronic device, also known as condenser which stores electrical charges in the electrostatic field, formed by one or more conducting electrodes seperated by the insulated material or dielectric medium. In electrical engineering, Electric Charge is the physical quantity stored in a capacitor that creates the potential difference between the terminals, often represented by an alphabet Q. The electrostatic charge is carried by electrons and protons of an atom. The electron & proton carries the positive and negative charges respectively. The product of capacitance and voltage across the terminals represent the total charge of a capacitor. The measurement unit of electric charge is coulombs. Similarly, the Electrical Energy often represented by an alphabet W, is the act of moving electric charges from the capacitor to accomplish the work. It's generally measured in Joules.